Walking through the city center of Freiburg, located amongst the rolling hills of the Black Forest in southern Germany, it is hard to notice much besides the pressing crowds of shoppers and the rumbling of the trams rolling by every three or four minutes. If you do not watch where you are walking, chances are high that you will run into another pedestrian or be struck by a tram. Once I became accustomed to this hustle and bustle during my time as a student at the university in this beautiful city, I began to notice the less obvious, yet extremely more intriguing historical aspects of the city: the massive statues in the town center, the plaques on buildings dedicated to those who played significant roles in German history and those who fell victim to the atrocities committed under the Nazi regime. There is a plaza at the university dedicated to The White Rose (Die Weiße Rose), the student group that posed a resistance to the Nazis, and a memorial placed at the site where the Jewish synagogue destroyed during the Night of Broken Glass once stood. These memorials are larger, and easily catch the eye, but if you walk through the city during a quieter time of day, and watch where you step, you might be surprised by what you stumble upon. Situated in the pavement before the entrances to shops, offices and businesses you will notice bronze squares with inscriptions on them. In the photo above, the stones are located in the pavement directly in front of a store called The Body Shop. Immediately prior to the photo being taken, a woman was standing on the stones peering at the wares in the shop window. She never once looked downward to take notice of what she had placed her feet on. Upon closer inspection, you realize that they have names and dates, along with other anecdotes. You ask yourself, “What are these? Who was this person, whose name is so easily missed, but also always present in the midst of daily life?” You have just stumbled across the Stolpersteine (“Stumbling Blocks”) memorial, and asked yourself the very questions these stones were meant to evoke. In the spring of 1933, Adolf Hitler and the National Socialist Party (Nazi) took power in Germany. They began a campaign, primarily against the Jewish population of Germany, but also the Romani (Gypsy) and Sinti peoples, homosexuals, communists, socialists, Jehovah’s witnesses, religious dissidents and even the handicapped and infirm. Persecution began with boycotts of Jewish business, their dismissal from schools and the civil service and continued to escalate until November 9, 1938: The Night of Broken Glass. On this night, many Jews were killed while billions of deutschmarks in damage was inflicted on Jewish property and residences, and some 30,000 Jews were rounded up and imprisoned in concentration camps. Many Jews fled abroad to escape persecution, while some of those who were unable to leave the country resorted to suicide in order to escape. Germany was not the only country where those targeted by the Nazi regime suffered. The axis of German power spread throughout most of continental Europe, encompassing but not limited to: a part of France, Denmark, Norway, the Netherlands, Poland, Hungary, Austria, and much of the western Soviet Union. Members of the groups targeted by the Nazi regime were forced from their homes and lifestyles, inflicting a ‘social death’ even for those who managed to keep their lives. Although nearly every person you might meet in this day and age has at least heard of the Holocaust and Nazi Germany, the majority having learned about it or at least had mention of it in school, there are countless numbers of ways in which the victims of the crimes committed by the Nazi regime are remembered today. There are Holocaust Memorials in countries never occupied by or direct victims of the Nazi regime, as well as in almost every locale affected by the German regime in Europe and one could spend much time analyzing them. The following study will focus on the memorialization of the Holocaust in one country, namely the one responsible for perpetrating the crimes: Germany. How does the population (albeit one primarily of the descendents of the original perpetrators), responsible for the death of millions, remember those who suffered? I will focus my discussion on the project of the Stolpersteine (“Stumbling Blocks”) in Germany in order to better understand the place of the Holocaust in daily life through memorials. Memorialization of the Holocaust in Germany is an extremely complicated process, which began almost immediately after the end of the war. As James Young described it in his book titled The Texture of Memory, Holocaust Memorials and Meaning, “ Holocaust memorial-work in Germany today remains a tortured, self-reflective, even paralyzing occupation. Every monument, at every turn, is endlessly scrutinized, explicated and debated” (Young, 1993). There are national, government-sponsored memorials in almost every city. A majority of former concentration camps have been transformed into memorial sites, commemorating those who lost their lives or were simply interned at these locations. 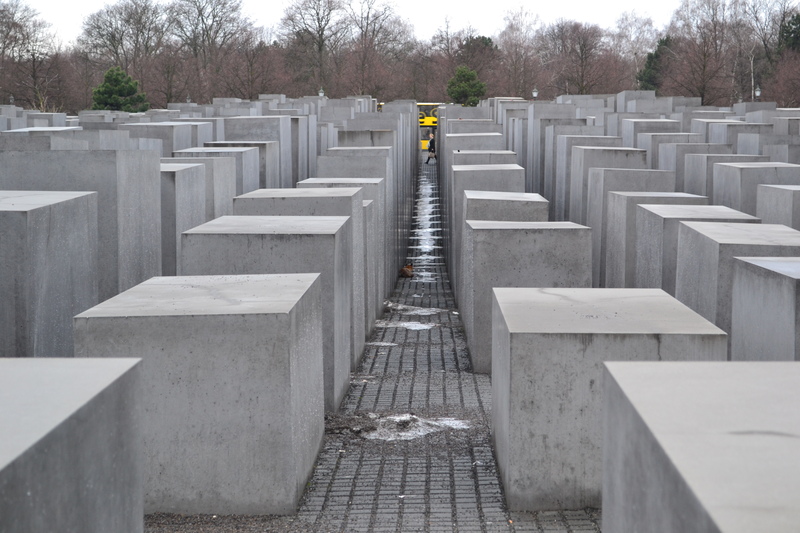 In Berlin, a national Memorial to the Murdered Jews in Europe, pictured above, has been erected after years of debate. A multitude of museums exist, dedicated to educating future generations on the atrocities committed under the Nazi regime and those that were victimized. There have even been counter-monuments constructed by artists recognizing the necessity of memory, but also their incapacity to remember events, which they themselves never experienced. What sets all of these memorials apart from those erected in other eras in history, is that the German government has made an effort to remember victims of crimes it has perpetrated, instead of the usual monuments erected by victors to commemorate their triumphs or victims memorials to remember martyrdom (Young, 1993). Although these numerous government-funded memorials exist all over the country, the Stolpersteine project is privately developed and also privately funded. The project began in 1994 with an exhibition in the St. Anthony’s Church in Cologne, Germany by the German artist, Gunter Demnig. Demnig was born in Berlin, in 1947, only two years after the end of World War II. He lived and studied there until 1971, when he moved to the city of Kassel to further his studies in art. He then took up residence in the city of Cologne, in 1985, where he continues to reside today. For his exhibition in Cologne, Demnig created his first 250 Stumbling Stones to honor the victims of the Holocaust. At the beginning of 1995, he laid his first stones in the pavements of the city, albeit illegally. It was another five years until Demnig was granted permission by Cologne to lay more of his Stumbling Stones throughout the city. 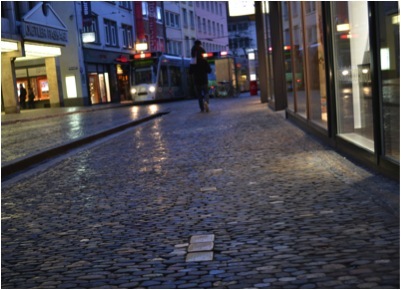 Since then over 32,000 Stumbling Stones have been laid in over 700 locations, and not only in Germany. The project has spread into Austria, Hungary, Belgium, Poland, Italy, Norway, the Ukraine, the Czech Republic and the Netherlands. Demnig himself always lays the first Stone in a village, town or city and continues to place most of the stones himself, though on occasion locals will place stones after the first ceremony (Demnig, n.d). As with the construction of any other memorial, the journey from planning to actual installation is a complicated one. Permission must first be obtained from the local authorities before a stone can be laid in a public place. This has been the greatest obstacle to the construction of Demnig’s memorials. Three years passed before Demnig was finally allowed to lay the stones in Cologne, and his Stumbling Stones are banned, except on private land, in the city of Munich. 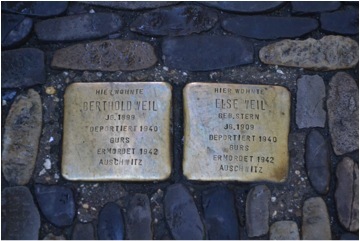 In Munich, criticism of Demnig’s work by Charlotte Knobloch, the President of the Central Council of Jews in Germany was that by placing the names of victims on stones placed in the pavement and allowing their names to be repeatedly trampled upon by people, dogs and bikes, simply victimizes them even more. It is also reminiscent of a Nazi practice of using Jewish gravestones as paving blocks (Goebel, 2010). Other resistance to the project comes from homeowners who do not wish to have the stones placed before their homes, complaining that “having quasi-tombstones in the sidewalk is bad for property values and business” (Westervelt, 2012). The support for the project is, however, far more significant. The number of currently placed stones, in addition to the numerous awards bestowed upon Demnig by cities across Germany, stands as evidence to this. The presence of these small memorials in cities and villages all over Germany, serves to represent the place of the Holocaust in Germany society. Stumbling upon these stones everyday prevents anyone who sees them from forgetting the terrible crimes of the past. Demnig’s motto, with regard to his motivation for the project, is simply “a person is only forgotten when his or her name is forgotten” (Demnig, n.d). Rather than the necessary conscious excursion and, sometimes, costly fees often required to visit the memorials, concentration camps or museums, the placement of these stones in locations present in daily life allows their purpose to be recognized by all. They do not allow the memory of the horrid events of 1933-1945 to be forgotten, or isolated to specific locations and allotted times in a daily planner, but rather make it accessible for almost everyone at any moment. They maintain a living memory of those victims, as well those events, which might otherwise be forgotten. Perhaps not a possibility in our generation, but without constant reminders present in daily life, it would be quite feasible for future generations to allow their memory of these events to lapse. These stumbling stones, with their names and stories, will serve to remind against forgetting, when no more survivors live to recount their experiences. As Young so aptly stated, “Victims are remembered according to the experiences and identity of the rememberers” (Young, 1993). The simple design of the Stumbling Stones, along with their situation in the routine of everyday life, leaves the door for interpretation wide open. Unlike in museums or organized exhibits, where the information presented is at the discretion of the organizer, influencing the individual interpretation of events and the creation of the living memory, each person who encounters a stumbling stone is able to remember the victim(s) as he or she sees fit. Naturally, the majority of those who these stones represent are not present to remember the tragic events of their victimization themselves, or to relay their experiences to us observers, but these stones keep the memory of both the individual victims and the collective memory the Holocaust alive. The stones bring in to sharper focus the individuality of each victim, rather than allowing the memory to be that of a number, a total count of all that suffered. They also serve to bring these total counts in perspective, as the ‘death of millions’ is far more incomprehensible than ‘the death of a mother, father and daughter who lived in this house’. The existence of these stones is also a statement to the place the Holocaust holds in the German mentality. They are only placed with permission from those who reside or own the buildings in front of which they lie. Without the cooperation of all involved, the monetary donation and time devoted to research and installation, these memorials to those who fell victim to the Nazis would not exist. Representative of the quest for repentance and remembrance, they serve to remind both of those whose names are inscribed upon them and that the Germans have come to acknowledge their past and are on an eternal quest to come to terms with it. Jones, A. (2011). Genocide: A comprehensive introduction. (2nd ed.). New York, NY: Routledge.